DALTON, CHARLES, Roman Catholic priest, Franciscan, and vicar general; b. 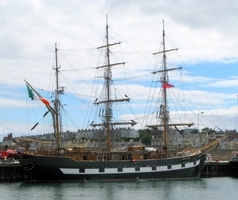 1786 near Thurles (Republic of Ireland); d. 17 June 1859 in Harbour Grace, Nfld. Charles Dalton is known to have been a student at St Kieran’s College, County Kilkenny (Republic of Ireland), in 1813–14. By 1819 he had become a Franciscan priest. Closely associated thereafter with the Clonmel friary, of which he was guardian from 1824 to 1831, Dalton was noted for his reacquisition of the medieval Clonmel abbey, which had been in Protestant hands since the Reformation. Recruited for the Newfoundland mission by the new bishop, Michael Anthony Fleming*, Dalton arrived in St John’s on 2 June 1831. 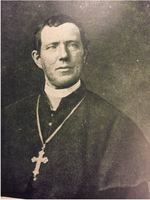 He was actually one of eleven priests, including Edward Troy* and James W. Duffy, who were brought from Ireland between 1831 and 1833. Fresh from the victory of Catholic emancipation, this group markedly changed the character of the priesthood in Newfoundland. 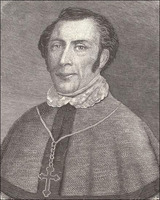 Dalton served in St John’s with Troy as a curate to Fleming until September 1833, when he succeeded Thomas Anthony Ewer* as parish priest of Harbour Grace. Although lately reduced in size by the creation of the new parish of Brigus, Harbour Grace was still a populous parish, encompassing a large part of Conception Bay. With two assistant priests, it was next in importance only to St John’s, and Fleming’s choice of Dalton to be its pastor was a mark of his confidence. Indeed, Fleming and Dalton seem to have enjoyed an excellent relationship. Dalton was Fleming’s vicar general for a time in the 1830s and he was also the bishop’s companion on several lengthy voyages, including the episcopal visitations of the north and south coasts in 1834 and 1835 respectively and a recuperative trip to Ireland in 1845. In 1843 Dalton was named an executor of Fleming’s will. Active participation in Newfoundland politics was a trait of many of Fleming’s clergy, and Dalton was no exception. During the general election of 1836 he openly favoured the four Liberal candidates who were victorious in Conception Bay and led a procession supporting two of them, Robert Pack, a Protestant, and James Power. The success of Edmund Hanrahan* in the 1840 by-election there was also attributed to his influence. Dalton was never accused of intimidation, however, and he had no part in the violence that ended both campaigns. Nor is there any evidence that he or his curates had even remotely encouraged the vicious attack in his parish on Henry David Winton in 1835, despite Governor Henry Prescott*’s attaching blame to the Catholic priesthood. In 1852 Dalton unsuccessfully attempted to recruit Thomas Ridley* and John Munn*, both Protestants, as local candidates. As a school board member appointed under Newfoundland’s first education act (1836), Dalton was a principal in the dispute which led to denominational schools. This act, which Roman Catholics supported, provided for public education in non-denominational schools. Nevertheless, at its first meeting, the Conception Bay board adopted the King James version of the Bible as a school text, to be read without comment outside regular hours to “children of the parents who desire it.” Catholic board members unanimously objected to the use of this Bible as discriminatory and threatened to resign unless the governor overturned the provision. Prescott thereupon requested that Conception Bay adopt instead the St John’s by-law, which provided for the withdrawal of children from school for religious instruction. This failed to carry, since to most Protestant members of the board it was equivalent to a vote for the removal of the Bible. Dalton and the other Catholics once again demanded that the original provision be overturned, making it clear that otherwise Catholic children would not attend the new schools. When the governor acquiesced, the non-Catholic majority maintained that they could not in conscience allocate funds where the Bible was excluded. This impasse was finally resolved only by the establishment of separate Protestant and Catholic boards in 1843. Dalton was an ardent Irish nationalist and a devoted admirer of Daniel O’Connell. A staunch foe of union in Ireland, he publicly expressed the view that O’Connell would be instrumental “in raising our degraded country from a province to that place in the scale of nations which her natural position entitles her to.” Dalton assiduously promoted the collection in Newfoundland of “repeal rent,” contributions to the campaign for the dissolution of the union between Ireland and England, and was a generous personal donor to it. In 1844 he was prominent in the protest movement against O’Connell’s imprisonment. Dalton was a strong supporter of Irish philanthropic causes. He made substantial personal donations to the restoration of the Clonmel abbey, to the Irish Franciscan monastery in Capranica di Sutri, Viterbo (Italy), and to the victims of the Irish potato famine even when his own parish was suffering from the same blight. This personal largesse may have been made possible by his ownership of a fishing schooner. Dalton did much for the development of his own parish. In the tradition of the Irish priests of his day, he was especially active in church building. He had churches constructed in Carbonear by 1836 and in Spaniard’s Bay by 1844. His major undertaking, however, was the erection of a new stone church at Harbour Grace to companion the cathedral under way at St John’s. Dalton had appealed for funds as early as 1844 and went to Ireland the following year to procure stone for the work. Financial difficulties ensued, and construction did not start until 1852. The new church, accommodating 1,200, was officially opened the next year. Enlarged and embellished by his successors, it became the core of the first cathedral of Harbour Grace, which burned in 1889. The first Newfoundland convents outside St John’s owed much to Dalton’s encouragement. As early as 1839, he had purchased a house and land at Harbour Grace for convent use. However, not until 1851 was a convent of the Order of the Presentation of Our Blessed Lady established there. A second foundation, at Carbonear, followed in 1852 [see Miss Kirwan, named Sister Mary Bernard]. The convent schools meant improved educational facilities for young women and complemented the 11 Catholic schools already in existence in the parish. A new diocese of Harbour Grace was established in 1856. Dalton’s advanced age and poor health precluded his being considered for the office of bishop, but the appointment went to John Dalton*, his nephew and charge from youth, who was curate in Carbonear. The senior Dalton became the diocese’s vicar general. 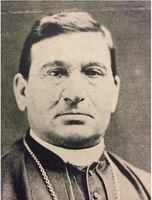 Charles Dalton ably served both his bishops and his parishioners during the 25 turbulent years of his ministry. At a time when religion and controversy were nearly synonymous, he had friends of every class and denomination. His benevolence, his simplicity, and his hospitality towards all were the characteristics that most impressed those who knew him. Father Dalton may well have served as the model for Father Terence O’Toole, the inoffensive pastor of “Bay-Harbour,” in Robert Traill Spence Lowell*’s novel, The new priest in Conception Bay (2v., Boston, 1858; repr. in 1v., Toronto, 1974). AASJ, Fleming papers; Mullock papers, diaries, 1851–52, 1856. Archivio della Propaganda Fide (Rome), Scritture riferite nei Congressi: America Settentrionale, 5 (1842–48).Basilica of St John the Baptist (Roman Catholic) (St John’s), St John’s parish, reg. of baptisms. Cathedral of the Immaculate Conception (Harbour Grace, Nfld. ), Reg. of baptisms (mfm. at PANL). M. A. Fleming, Relazione della missione cattolica in Terranuova nell’America settentrionale . . . (Rome, 1837). Liber Dubliniensis: chapter documents of the Irish Franciscans, 1719–1875, ed. Anselm Faulkner (Killiney, Republic of Ire., 1978). J. T. Mullock, The Cathedral of St John’s, Newfoundland, with an account of its consecration . . . (Dublin, 1856). Nfld., House of Assembly, Journal, 1848–49; Legislative Council, Journals, 1837. Newfoundlander, 9 June 1831; 14 Feb., 18 April, 29 June, 8 Aug., 21 Sept., 7 Nov. 1833; 27 March, 17 April, 26 June 1834; 31 May 1845; 15 July, 5 Aug. 1847; 7 June 1852; 1 Dec. 1853; 20 June, 1 Aug. 1859. Newfoundland Indicator (St John’s), 17 Feb., 18 May, 10, 27 July 1844; 4, 11, 18 Jan., 31 May 1845. Patriot (St John’s), 1 Sept. 1835; 12 Jan., 8 Oct. 1836; 24 July 1844. Pilot (St John’s), 28 Feb. 1852. Public Ledger, 28 Oct., 1, 4, 8, 22 Nov. 1836; 30 Oct., 17 Nov., 1, 11, 29 Dec. 1840; 17 May, 29 Aug. 1843. Sentinel and Conception Bay Advertiser (Carbonear, Nfld. ), 19, 26 Feb., 12 March 1839. Times and General Commercial Gazette (St John’s), 6 July 1836. Weekly Herald and Conception Bay General Advertiser (Harbour Grace), 27 Oct. 1847, 28 June 1848, 2 June 1852, 30 Nov. 1853. Peter Birch, St. Kieran’s College, Kilkenny (Dublin, 1951). Centenary of the diocese of Harbour Grace, 1856–1956, [ed. R. J. Connolly] (St John’s, 1956). Howley, Ecclesiastical hist. of Nfld. Patrick Power, Waterford & Lismore; a compendious history of the united dioceses (Dublin, 1937). Raymond J. Lahey, “DALTON, CHARLES,” in Dictionary of Canadian Biography, vol. 8, University of Toronto/Université Laval, 2003–, accessed April 24, 2019, http://www.biographi.ca/en/bio/dalton_charles_1789_1859_8E.html.